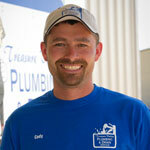 Cody Rollins is a Journeyman Plumber. He grew up in New Plymouth and graduated from New Plymouth High School. He joined us at TVPD in June of 2006 and has been an asset to our company ever since. Cody loves to hunt and be in the outdoors. He still resides in New Plymouth with his wife, Dani, and their two children, Bodee and Lilly.